Electric Actuators for Automated Adjustable Hospital Beds |Venture Mfg Co.
Hospital beds are among the most critical items within a healthcare center. As hospitals are becoming more advanced, and the needs of patients in terms of healthcare are increasing, it is important that critical items like high quality hospital beds be upgraded as well. This will ensure that the patient is always comfortable, and able to rest, thus improving his recovery process. Electric actuators are the perfect solution to transform hospital beds into high tech, adjustable devices, which can enhance the patient’s comfort and recovery. 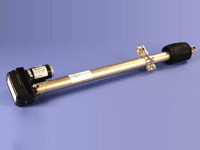 Medical actuators are designed to reduce time consuming preparations performed by the nursing staff on a regular basis. The actuators are installed within the frame of the bed. Multiple actuators are installed in different areas, so as to provide precise, yet adjustable movements. All the actuators are connected to an electric motor, which provides the requisite power for vertical and horizontal movement. Connecting cables connect the actuators to the motor, to the mattress platform, and the hand-held remote control. When the patient wishes to change the electric hospital bed’s position, he presses a button on the remote control for that particular movement. An electric current is sent down to the electric motor, starting it up. The motor supplies power to the actuator in question. The actuator begins to move, causing the mattress platform to move as well in the desired angle or direction. The user lets go of the button when the desired adjustment has been made. The electric motor stops providing power, causing the actuator to stop moving as well. Venture Mfg. 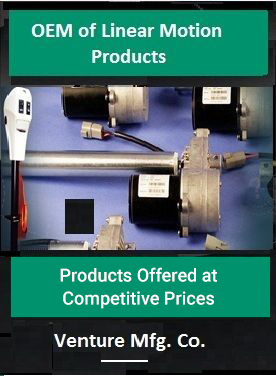 Co. prides itself on designing and manufacturing different types of electric actuators used in the medical industry. Our actuator system for hospital beds are known for their speed, precise movement, robust construction, and long-lasting performance. We are always willing to take on projects that are unique and challenging. The hospital bed is just one of many applications where our linear actuators can be used. We can design these actuators in the size, shape, and with the materials required for your application.